Register before September 1 to get discounted rates on this year's conference, which takes place on September 28 and September 29. 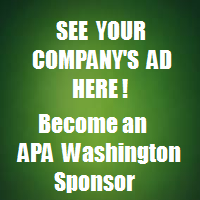 APA membership is now free for all currently part-time and full-time students! Take the survey so our local chapter can better serve you. The small community of Plain will be studied to analyze strategies to mitigate for post-wildfire flooding. Dinah is from the Chicago area, has worked in Vermont, and now calls Yakima home. The waiver would allow less than a 50 percent local match.